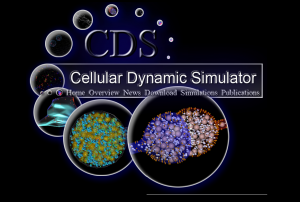 The Cellular Dynamic Simulator (CDS) was designed to simulate diffusion and chemical reactions within crowded molecular environments. CDS employs an event driven algorithm that allows precise calculation of the timing of collisions, reactions and other events for each molecule in the environment. With the CDS, we can simulate simple enzyme reactions, aggregation, channel transport, as well as highly complicated chemical reaction networks of both freely diffusing and membrane bound multi-protein complexes.